About all we did today was drive 359 miles and go through US Immigration & Customs. We crossed into the USA at Sault St Marie. Mavis was prepared with a long written list of provisions but the officer didn't even ask about meat, fruits, and vegetables.. We were delayed about 20 minutes. 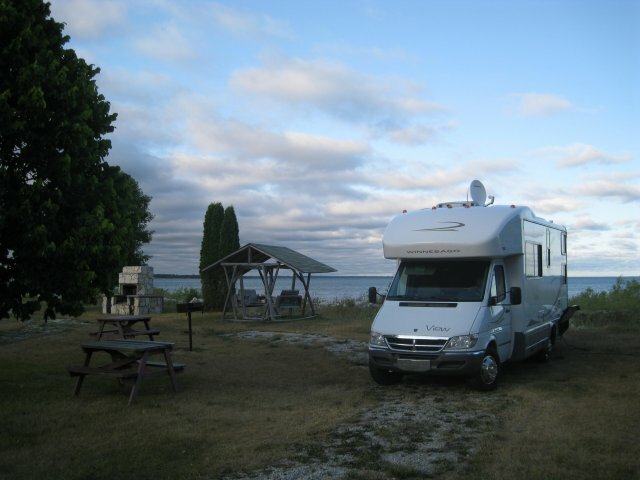 Tonight we are at a unique campground on the north shore of Lake Michigan (see photo) called Driftwood Shores Resort and RV Park at Manistique. We have power and water plus our own swing set, a long bench to sit and watch the water, a fireplace, and a picnic table; all this for just $27.50.. For a Friday night there are not very many campers in this beautiful spot.